Open House New York Weekend and Other Things To Do In New York & Roosevelt Island This Weekend - Have Fun! Attention, voyeurs! And trespassers, too. There's an event happening soon that's tailor-made for your obsessions. "Open House New York" presents a dream opportunity for anyone who likes to peek at places where we're normally not allowed - or at least at areas we usually can't crash for free. 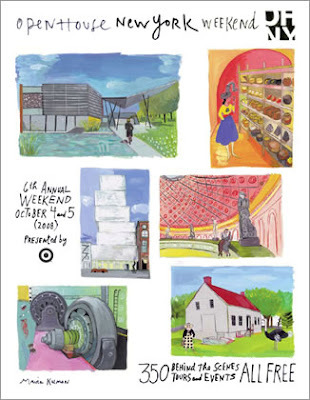 Now in its sixth year, this weekend-long event (Oct. 4 and 5) throws open the doors to hundreds of city landmarks, museums, park areas and homes - many of them otherwise shuttered, obscure or simply ignored. Essentially, OHNY operates like a monster-size treasure hunt, allowing anyone to find scores of pleasurable sights throughout the five boroughs. Along the way, you can poke into places of considerable historic worth, artistic importance or, if nothing else, eccentric flair. There will be a Roosevelt Island Walk as part of OHNY on Saturday at 4:15 beginning from the Tramway station on 2nd avenue and 60th street (maximum of 25 people), a tour of Octagon and Lighthouse Park on Saturday and Sunday as well as a viewing of the Roosevelt Island Historical Society Kiosk. Also, if you happen to be on Roosevelt Island this Saturday, check out the Roosevelt Island Kidfest and the Run For the Congo Women 5K race/walk. For other suggestions as to what to see during OHNY check out the Bowery Boys, the Brooklyn Daily Eagle and Interior Design. Here are some other ideas on what to do in New York City this weekend from the NY Times Urban Eye, NY Post Weekend Calendar and Newyorkology. On Saturday, October 4, Parts of East Road and Main Street (Around Goldwater Hospital and in front of the Subway Station) will be subject to closure between 9:30am and 10:30am due to a 5K race. 5K Race will be taking place around the perimeter of the island and will be contained mostly to the seawalls. Please plan accordingly. 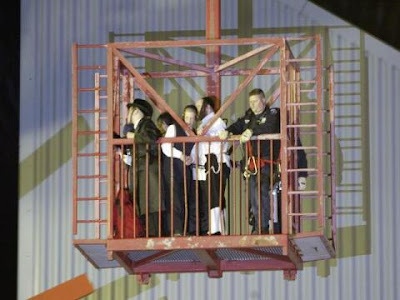 Not that I am hoping for the situation to arise, but the rescue from the Portland Tram cabin looks like much more fun than the bucket used for Roosevelt Island cabin rescue. 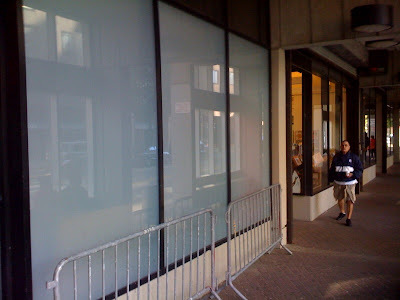 Are Frosted Main Street Windows Sign of Progress In Finding Retail Tenants For Long Empty Roosevelt Island Main Street Stores? To give a better appearance to the vacant stores. No progress other than we have obtained a fair market value appraisal from an appraiser and are prepared, in conjunction with the real estate advisory committee of the Board, to proceed to issuing an RFP for the vacant stores to which either individual prospective tenants may apply or a master leaseholder may respond. Until the committee meets and we deliberate, too soon to know. Scheduled for 6 this evening. Yes, the Public Authorities Act is still a problem. Here's a preview of tonight's Vice Presidential debate between Senator Joe Biden and Governor Sarah Palin. They respond separately to questions by Katie Couric on Roe v. Wade, the constitutional right to privacy and whether either can name a Supreme Court decision they disagree with. The Palin story is steeped in religion. Her supporters believe she is a modern day version of the biblical Queen Esther, sent by God to save the nation from peril "for such a time as this," and prophetic e-mails proclaiming that Palin is going to win are being forwarded around cyberspace as we speak. McCain's reckless and ill informed decision to select her as his Vice-Presidential candidate should disqualify him as being competent to be President. Here's more of Sarah Palin's greatest hits! On the other hand, below is the Governor Sarah Palin Bio video from the Republican Convention. What impressed me most about McCain was the effect he had on his audiences, particularly young people. When he talked about service to a cause greater than oneself, he struck a chord. He expressed his message in words, but he packaged it in the McCain story -- that man, beaten to a pulp, who chose honor over freedom. This had nothing to do with access. It had to do with integrity. Does John McCain really really think Americans are stupid enough to buy this nonsense. At this evenings meeting of the Roosevelt Island Residents Association (RIRA) Common Council, there was a discussion regarding the possibility of Roosevelt Island getting our own on site ambulance service. There was confusion regarding whether this was a temporary basing of the ambulance or if it was a permanent stationing. 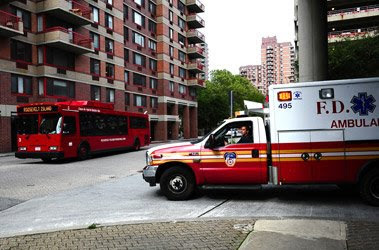 Upon returning home, I learned that an ambulance is now permanently stationed on site at Roosevelt Island and that it already has been of service to a resident. With new buildings going up and new stores opening their doors, Roosevelt Island has a lot to offer. But it couldn't offer residents their own ambulance, until now. Within hours of going into service, the unit, staffed by EMTs Jacqueline Summerford and Mike Triolo, received a call for someone who was having difficulty breathing. They were able to arrive on the scene and treat the patient within four minutes. “To get to any emergency faster is always important to us,” said EMT Triolo. Great job by the EMT's and thanks. If you are looking to get a feel for what Roosevelt Island looks like, from coming out of the subway to walking around the place, this is one of the best video travelogues of Roosevelt Island I have seen. The video includes shots of Renwick Ruins, Southpoint Park, Main Street, the Octagon and Lighthouse Park, the Tom Otterness sculptures, Church of the Good Shepherd plus much more. Good job by Chris and Nick. 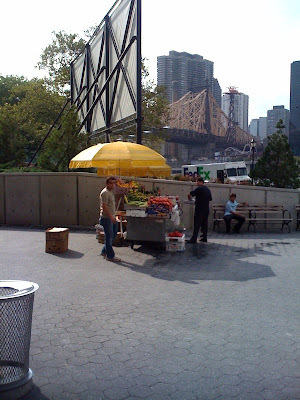 The addition of more restaurants and outdoor eating options in the Southtown Riverwalk area is a welcome amenity for Roosevelt Island but it has also resulted in a notable increase in rats brazenly scampering all over the place particularly on the lawn in front of Starbucks, near the new fruit stand and elsewhere. While sitting at the Starbucks outdoor patio recently, I noticed out of the corner of my eye what I thought (hoped?) was one of the black squirrels scampering nearby but soon realized it was a huge rat. Very, very disgusting! I have received several messages regarding a rat problem in the Southtown area, particularly around the new Fruit stand concession and lawn in front of Starbucks. I even saw a huge rat scampering in front of the service entrance at 425 Main. Is this the responsibility of the Landlord to address or RIOC? If RIOC's responsibility, can you advise what is or will be done about this problem. ... and Southtown (Hudson/Related/Riverwalk) are all in the fight together, that we live in an urban waterfront environment and there never will be a perfect solution, that cleanliness and attention to trapping, poison, etc. are a good thing, but that construction sites in particular, where established nests are disturbed always give rise to rat appearances. Everyone has the problem. We need the Pied Piper. On Monday evening, I noticed this mound of garbage piled up high outside of Riverwalk buildings 3 & 4 on Main Street which could make a gourmet feast for our neighborhood rats. 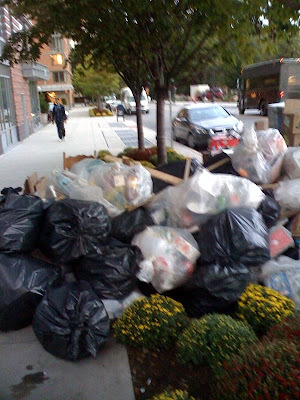 ... there is an additional problem of the Riverwalk buildings leaving their garbage bags on the street from early evening until early morning when the garbage is finally picked up. A sumptuous feast for the rats as well. 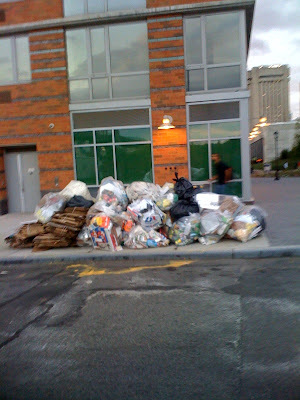 Yesterday, the garbage from Riverwalk Buildings 3 and 4 were on the street from at least 5:30 until 4:30 the next morning. Attached is a picture. Will Southtown ever be connected to the Island's underground garbage removal system? The AVAC system is connected to Southtown. I do not know the origin of the garbage piled outside except if its from the commercial stores. Need to figure something out. One thing we as residents can do is to stop throwing left over take-out food from the Fruit Stand, Starbucks, Nonnos and Fuji East on the street and put it in the waste basket where it belongs. I have seen many people just throwing their scraps on the sidewalk or lawn despite their being garbage cans not more than 5 feet away. Also, people throwing their crumbs to the pigeons at Starbucks contributes to the rat infestation problem here on Roosevelt Island. It would be helpful if we stop supplying meals to the rats and that Starbucks put up some signage advising others not to feed the pigeons. Unlike the Portland Oregon Tramway, no love songs have yet been written for the Roosevelt Island Tram but RIOC has announced that they will be holding a public information meeting on the Roosevelt Island Tram Modernization Program this Thursday, October 2 at 7 PM in the Good Shepherd Community Center. For more information on the Roosevelt Island Tram modernization project, click here and take a look at this week's Main Street WIRE as well. Below is the transcript from August 5 2008 Empire State Development Corp.'s hearing on the Roosevelt Island Tram Modernization Program. On pages 14 - 15 RIOC President Steve Shane presents the case for the Tram Modernization Program. The existing system has functioned well for thirty years and can continue to function for the reasonably foreseeable future subject to unplanned mechanical failures because it is a complicated and aging mechanical system. But to assure reliability going forward, the dual haul system, replacing the jig-back system, is really the way to go in the opinion of all of the transportation people who have studied this system. And that is the basis of the public benefit that is the subject of this hearing. Since Mr. Shane acknowledges that the Tram can function well for the reasonably foreseeable future, the question is if this modernization program is worth the projected $25 million cost, the great transportation burden placed on many elderly, handicapped and other residents from the prolonged 6- 9 months (hopefully) shutdown of the Tram and the decreased cabin capacity, despite increase resident population. of the new tram (current capacity of 125 will be reduced to 100) as expressed in the views of those Roosevelt Island residents testifying during the ESDC hearing.